In response to months of community feedback and input, the Foundation is announcing several minor changes to its zoning and lakefront protection ordinance applications. These updated applications will be submitted to the City of Chicago today in advance of the Plan Commission hearing on May 17. Download the hi-res image HERE. Plaza Entrance from Stony Island: In response to public input about traffic on Stony Island and visitor access, the design no longer includes the 10 foot curb extension in front of the plaza on Stony Island. This will create more usable streetside access and help ease traffic on Stony Island. Plaza: To accommodate feedback from the community about usability of the Plaza for events and gatherings, the updated design removes a sunken courtyard in the middle of the Plaza. This will enable the Plaza to be more functional for gatherings and events of all types. Children’s Play Area: Accommodating feedback from families preferring the children’s play area to be closer to the campus buildings and Stony Island Avenue for convenience, the design relocates the children’s play area to directly southeast of the Forum Building into the Wooded Landscape. This new location will offer views of the Lagoon and Lake Michigan, giving the area a special character. The location in the Wooded Landscape will take advantage of shade and shelter as well as opportunities to explore, linger, take risks, and learn through the textures, sights, smells, and sounds of the natural world. Previously, the children’s play area was in the southeast corner of the site. Athletic Center: The shape and roof of the Athletic Center have been simplified in response to comments that the original, more “organic” form of the building was not in keeping with the other traditional structures within the Park and to minimize the building’s presence from Stony Island. The height of the Athletic Center has increased slightly, from 18′ to 20′. 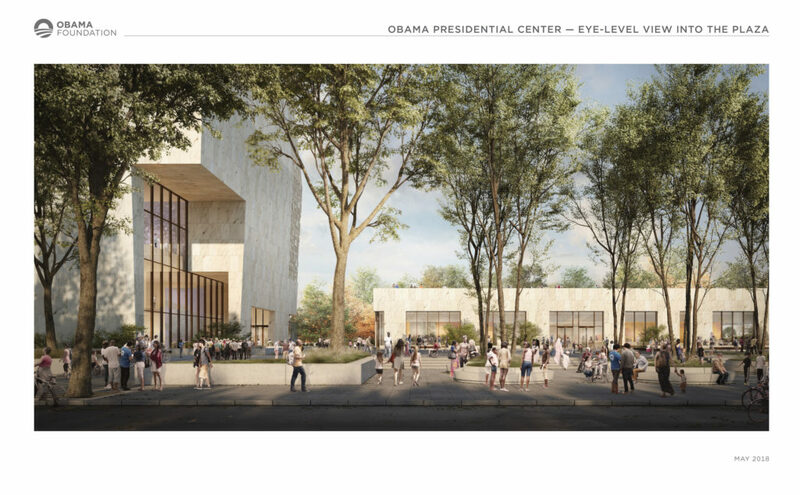 The Foundation also included a new rendering with the application that illustrates the openness of the OPC and Plaza to the community. The OPC is designed to activate the street and encourage visitors to explore the surrounding communities. 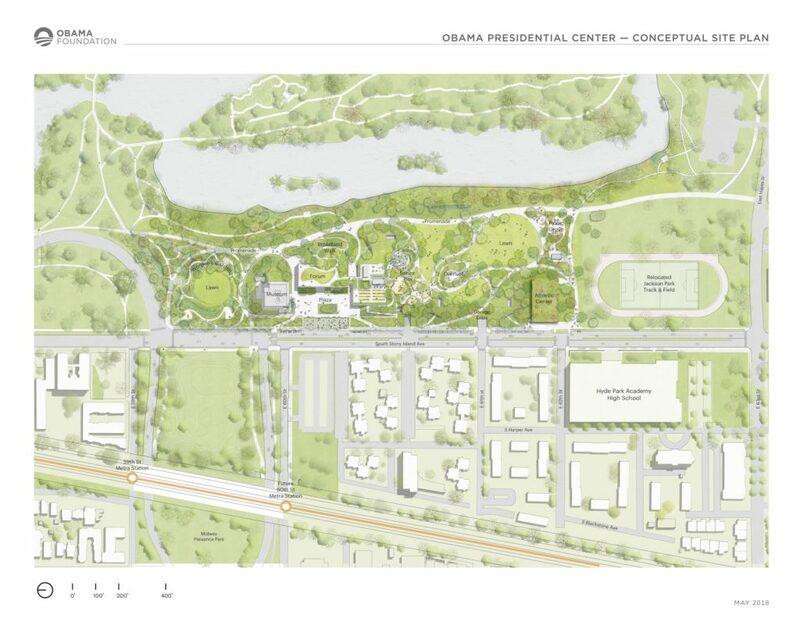 The Plaza and campus opens up onto Stony Island, serving as a gateway into the park from the community.